I do not consider myself a pushy person. I’m generally laid back and prefer working hard and waiting to be given things over asking for things outright. This year, I have to admit that the Uptown Theater held the top spot on my “Nest Sites to Visit” list. So, I worked hard and waited and ‘lo! Last week, Mary asked me to come along on the Uptown Theater banding. Huzzah! Thank you, Mary! This morning, I made my way to the museum around 8:30am. Mary scheduled the banding for 11am, so I figured that would give me time to monitor the museum pair for a bit before we were due to leave. Over the past week, we’ve seen less and less of the museum pair. I think Mary has stopped theorizing about what they might be up to, but it looks like they won’t be nesting on the museum, at least this year. They seem to be hanging around still, both on the north and south sides. We figure they are caching food up there. I watched the north side from 8:30am to about 9am and saw nary a peregrine. At 9am, I decided to wander around the building to the south side. On my way, I noticed the northside crow babies seem to be getting ready to fledge. I counted three. I also saw the female kestrel sitting on an outcrop on the far northern corner. We’d hoped the kestrels and peregrines wouldn’t come into conflict, so it was nice to see the female alive and well. For the next hour, I watched the south side of the museum, the airspace over Soldier Field and the red brick building a ways away to the southwest that was a favorite hunting spot for the museum pair. Alas, no peregrines. Mary came down at 10am and we took off for the Uptown, with a quick stop at the zoo to pick up John the vet tech. We arrived at the Uptown Theater 20 minutes early, so John and I went around to the back of the building to check out the falcons. Zoom (the adult female) and “GiGi” (my nickname for the adult male) nest on one of the fire escapes near the top of the building. 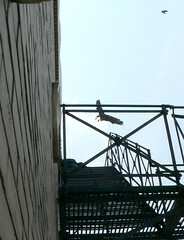 John and I could see one fuzzy chick through the fire escape grating and an adult sitting a little bit away. The other adult buzzed and dove around in the air above our heads. They both were very vocal and already seemed on heightened alert. I’ve been told that the Uptown birds are the most aggressive pair in Chicago at present. Watching one of them careen around in the air while the other guarded the nest and listening to them scream, I could sense this might be a wild banding. The female, Zoom, has been nesting at the Uptown Theater since 2002. 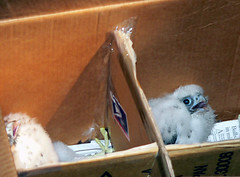 She was born in 1997 on the North Central Life building in Minneapolis, MN and arrived in Chicago in 1999, where she met Tracy, then a 3-year old peregrine hatched at the 5821 North Broadway nest. They nested on the First United Methodist Church in Evanston that year, successfully fledging at least one chick. She and Tracy nested in the same site for the next two years, but in 2002, Zoom decided to trade the Evanston site for the Uptown. Why? Who knows. Perhaps Zoom and Tracy didn’t like each other or perhaps the nest site wasn’t ideal. It’s interesting to note that in both 2000 and 2001, Zoom laid eggs, but none of the eggs hatched. 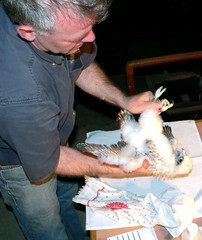 (Above right: The Uptown falcon banding crew with Dave, the Uptown caretaker. Tracy eventually went back to his home nest on Broadway and hooked up with a female named Auntie Em. 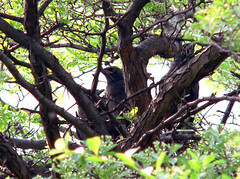 That pair still nests at the Broadway site to this day. The original female at the Uptown Theater, Minnie, established the nest with an unbanded male in 2001. The next year, the unbanded male was back at the nest but Minnie had been replaced by aggressive Zoom. They successfully fledged two chicks. In 2003, the unbanded male was replaced by an unnamed male (who I call “Gigi”) (b/g, G/G) and that’s been the Uptown pair ever since. They tend to get a lot of attention, not just because they are beautiful birds, but also because the Uptown Theater is a building of interest in Chicago. 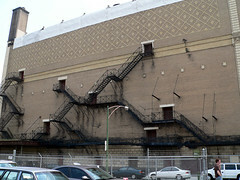 The firm of Rapp and Rapp built the Uptown Theater in 1925 for Chicago movie palace moguls Balaban and Katz. 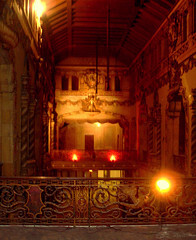 Rapp and Rapp used the Spanish Revival style in the design of this immense and opulent movie palace. 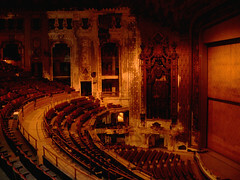 When they finished, the Uptown took its place as the largest movie palace in Chicago and the second largest in the U.S., behind Radio City Music Hall in New York City. 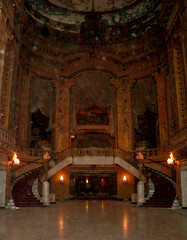 The grand lobby soared 5 stories and the auditorium seated 4500+ with a stage in front large enough to comfortably fit a 30 piece orchestra beneath the 3-story screen. One of the banding team, Kanae, told me she remembered seeing Gone With the Wind there when she was little, just after her family had immigrated from Japan to Chicago. ANYWAY. a grassroots campaign called the “Friends of the Uptown” organized in 1998 with the goal of saving the building. The cost to restore the Uptown Theater to its full glory has been estimated to be somewhere around $40 million. The current owner of the building seems very aware of the historic value of the building and is rumored to be looking for a way to afford restoration. At present, the building is maintained by a cadre of very dedicated people, mostly volunteers. This should explain why I was looking very, very forward to taking a rare step inside the Uptown. John and I made our way back around to the entrance just in time to see a woman walk up to greet Mary. I knew who she was before Mary introduced us, mainly by the beautiful camera slung around her neck. Must be the famous Uptown peregrine (and bird) photographer Kanae! I’ve been drooling over Kanae’s photos for the last year and a half and have wanted to meet her for some time. She turned out to be just as nice as I thought she’d be and the two of us geeked out on photography until Matt, his wife and another Shedd researcher showed up. Dave, the caretaker of the Uptown for over 20 years, opened the plywood door at precisely 11am and I got my first look at the original front entrance of the grand Uptown. Really, I don’t even know how to describe the place. I suppose the fact that I’ve already mentioned the Kootenai Lodge should allow me to say that the Uptown and the Kootenai not only share endangered status, but also that undefinable majesty and presence that few very special places in the world possess. If this building isn’t saved and restored, we of Chicago should be jailed as a whole for 1st Degree Wanton Crimes Against Historical Architecture. My love of the building began that second, but listening to Dave, it wasn’t hard to hear that his love has burned at solar levels for the last 20 years. I get it, Dave – I lived at the Kootenai. These places move into the very center of your soul and they never leave. Dave gave us a short walking tour on our way up to the banding area. There were almost no lights, but even through the murk and despite the decay, the true beauty of the place could not be denied. Kanae and I snapped pictures wildly as we lagged behind the group and I hoped at least one of the pictures would actually turn out, given I didn’t have a tripod or time to really steady myself for the long exposure shots. When we entered the enormous auditorium, I literally lost my breath. CAV-ER-NOUS. 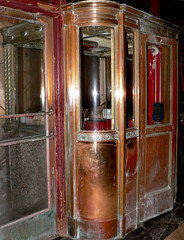 The banding area was a table near the fire escape door on the second tier of the balcony area. One shop light had been hooked to the railing over the table and it gleamed like a beacon. We set up quickly while Matt donned protective gear, muttering about how aggressive the Uptown birds could be. Finally, it was time. We opened the door to the fire escape and …. wow … Zoom and Gigi were RIGHT there, ready and screaming. Poor Matt got hit the whole way up to get the chicks (one half a flight on the fire escape) and the whole way back down. Kanae, Matt’s wife and I clicked off tons of shots, but I missed the one where Matt’s helmet actually cracked under the force of one of the hits. You could see bits of plastic coating explode off while Matt’s head rocked back. I heard his wife take a sharp intake of breath behind me. But, Matt was just fine. He was down in no time with three Uptown chicks in a box. Over the next half hour, the chicks got their brand-spanking new legbands and we got blood and bird lice samples. Mary and Matt decided all three of the Uptown chicks were boys this year, so welcome to Chicago, gentlemen! And then it was time to return the chicks to their anxious parents. I have to say, Matt got tagged a lot less on the way up to put the chicks back then on the way up to get them. I think that made his wife feel a little better, but then, she’s a vet, so I’m pretty sure she’s used to that sort of thing. 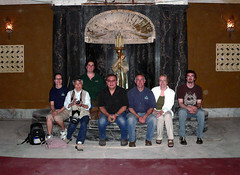 When we had all the banding supplies packed up, Dave took us on Uptown Theater tour, part 2. Man, that guy knew every tiny inch of the place and was a font of information. If they ever do restore the place, it would be a damn shame if they didn’t give him a full-time position as resident expert, story-teller and tour guide. His tour was fascinating. It was all over way too soon, but a busy day lay ahead for all. As for me, my mission (I chose to accept it) was to camp out near the Lakeview site to see if an adult pair had taken up residence or, better yet, had nested. We dropped John off at the zoo and then Mary gave me a lift to the Lakeview site. As we drove up, we saw an adult peregrine swoop up and land on a window-well near where peregrines had nested in years before. For the next two hours, I sat on the sidewalk and watched the building. I didn’t ever see two birds at one time. I saw one very active bird perch for a few minutes at a time on the window-well, then dive into the air to cruise around the area for awhile before coming back (or the other bird might have come in, hard to say). It (they) was way, way too far away to get any legband information, even with my scope on 75x. The bird(s) didn’t ever bring any food in with it (them), nor did it (they) seem like it was walking deeper into the well to check anything nestish. It (they) would simply land, do a sit ‘n’ preen, and then take back off after a little while. I’d say no nesting, but Mary will be the expert opinion on that one. Finally, the wind really started to kick up and I couldn’t keep my scope still or my belongings from blowing away. I headed for home on the Clark 22, VERY tired and hot, but VERY pleased with the day. ~ by Steph on May 24, 2007.